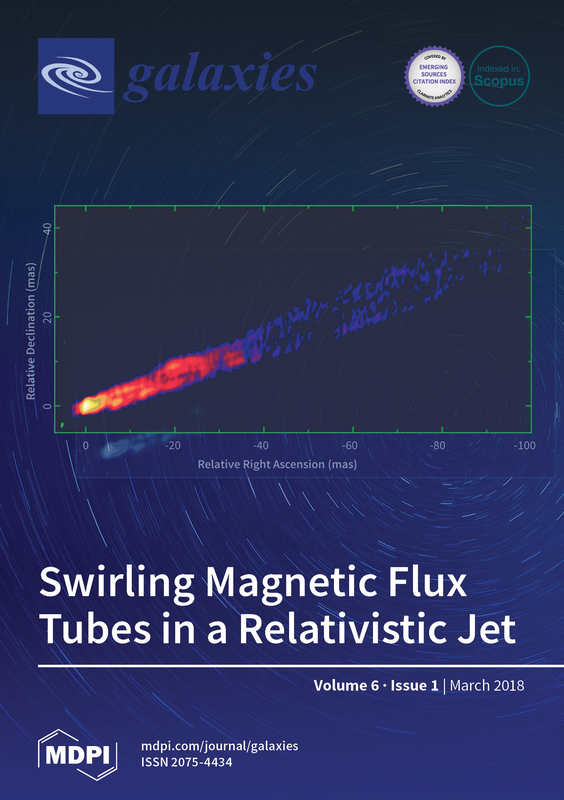 Cover Story (view full-size image) M87 jet magnetic flux tubes are observed here at 15 GHz by the VLBA (courtesy of Kellermann, K.; et al. ), possibly indicative of the magnetic Kelvin-Helmholtz instability. This pattern also appears in simulation models (Anantua et al. 2018) when the energy density of relativistic electrons in the radio jet does not decline with magnetic field strength at increasing radii from the black hole. With observation length scales over an order of magnitude greater than simulation scales, more remote processes such as coupling to the rotating interstellar medium may be responsible for the twisting flux tubes observed than in the simulation. Finite VLBA imaging resolution may restrict observers to seeing only the largest structures (the m = ±1 modes), while it may be possible to resolve smaller-scale structure in simulations. With the “Observing” Jet/Accretion Disk/Black Hole (JAB) simulations methodology, we may analyze disk/jet magnetohydrodynamic interactions to be exhibited by the EHT.